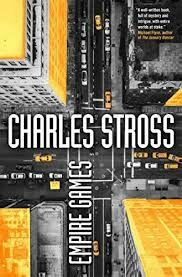 Stross does, however, provide enough information within Empire Games so that a reader unfamiliar with the original series can follow the book, if not fully enjoy it. As for the plot, backdrop and characters, Empire Games starts in 2020 in a parallel timeline to our own, in which renegade members of a ruling elite/criminal syndicate nuked the White House in 2003, and were in turn, along with the rest of their society, nuked back to the Stone Age by President Rumsfeld. The resulting American society is similar to the present-day USA, but under the thumb of an even more oppressive security state which utilizes nearly all-pervasive surveillance, and in which the government seems to be a theocracy, with the fundies, Mormons, and (yes!) Scientologists embedded in the power structure. In this horrid situation, a branch of the DHS makes an offer she can’t refuse to Rita Douglas, the (unavoidably abandoned) daughter of Miriam Burgeson, a minister in a democratic government in a third timeline, that is in arms race with the reactionary, monarchist French Empire, and that is conducting a crash technological/industrial revolution due to terror that the paranoid, violence-prone “Americans are coming.” This leads to the reason, in part, why the DHS forcibly recruited Rita — to act as a spy on her mother’s government and society. This is a grossly inadequate summary of Empire Games, but there are six previous books in this “universe” that provide the necessary back story, and it’s impossible to summarize them in a few hundred words (even if I remembered them more clearly). That said, there’s a lot to like about Empire Games, starting with the dedication: “For Iain M. Banks, who painted a picture of a better way.” Other positive aspects include Stross’s (as always) well drawn characters, intricate plot, and his accurate portrayal of the ruthlessness of the American government. The book even has an intriguing and unexpected twist right at the end. The only real complaint I have about Empire Games is that an explanatory prologue would have been a huge help in comprehending and fully enjoying a book so far separated from its predecessors. Highly recommended, nonetheless. But read the previous six “Merchant Princes” books first.